Bloodborne, like the other Souls games, provides an almost unparalleled challenge in modern gaming. It is an experience that never stops pushing back, and it forces you to use everything you have at your disposal to tackle the many difficult challenges that await. With this feat comes a steep learning curve. Sadly that isn’t all however, as it is as vague as it is challenging. So with that said, I present to you a few tricks that might help ease your suffering during the opening hours of this colossal game. Every Souls game has a parry of some sort. With the bold removal of shields in Bloodborne, it was a question of how parries and ripostes would work. After tinkering with the combat, it became apparent that ‘visceral attacks’ were Bloodborne‘s form of the parry. To pull of this devastating move, you must fire your left handed weapon the moment before an enemy hits you with their attack. The timing is tricky and will take a fair amount of practice, but pulling this off has a great effect. The enemy is temporarily stunned and falls down, leaving you approximately one second to walk up to their soon-to-be corpse, and hit the attack button for a crushing final blow. A staple of Bloodborne is that you can switch the state of your weapon with only the press of a button. You’ve probably seen a promotional video of the main character turning his gun into a spear, his whip into a cane, his sword into a scythe. This move proves useful as you are then open to a secondary function with it’s own set of attacks. What makes this even more useful however, is the weapon switching attack. If you do a simple R1 or R2 attack, you can follow up by hitting L1. It enables your character to use an attack while swapping his weapon. This might sound as if it’s not very useful, but it comes with it’s own strategic value. For example. When using this attack with the saw cleaver, it grants you a speedy attack like the folded form, and the range of the unfolded form. It has a wide sweep and is in most cases capable of knocking back enemies giving you a chance to breath. Each weapon has it’s own form of this, so use them well. If you’ve played a Souls game, you’ll remember the feeling of bliss that comes along with finally discovering a shortcut after a particularly long stretch. Bloodborne is no exception of the rule, as it might be the most shortcut-heavy Souls game yet. While this tip may seem obvious to some, it is no rarity to have players entirely skip exceptionally important shortcuts because they didn’t properly explore. with that in mind, keep your eyes peeled and your internal compass in check. If you’ve been walking for a while and you haven’t run into the next lantern, chances are you missed a shortcut. With the myriad of new mechanics at play in Bloodborne, it is easy to forget that we’ve been given a charge attack with each weapon. Holding R2 grants you a stronger form of an already strong attack that can help immensely with crowds of enemies or particularly spongy bosses. The key with charged attacks is to remember to give yourself enough time to fully charge it, so make sure you note the length of the enemies attack animation and the distance they travel while performing it. Ludwig’s Holy Blade has a lengthy charged attack for example, but successfully pulling it off will grant you the chance to follow up with another attack while the enemy tries to recover. It is very useful if utilized properly, so practice using it with each weapon and learn their unique effects. There are exceptions to the rule, such as Ludwig’s Holy Blade, but even it requires you to find an item so explore well and leave no corners unchecked. A lot of enemies in Bloodborne have some predictable move sets. The best way to defeat an enemy is to learn said move set and exploit it via telegraphy. Study enemies, and learn their attacks. If you get the timing down and you learn when a creature will do what, you can plan attacks accordingly, making each move a thoughtful one. A lot of enemies have big wind up animations or noises they make as they’re about to do attacks, meaning that they telegraph their individual move-sets well. It may sound like an obvious piece of advice, but too many new players will go into Bloodborne thinking it is a combo-focused action game. While it did abandon the shields, it did not abandon it’s focus on strategic and careful combat. Learn how to exploit an enemy via his moves, and you’re on the path to victory. This is a trick I didn’t learn until after I began writing this guide, and it’s definitely one I wish I would’ve noticed early on. Some bosses and enemies have weak points. They’re a bit hard to notice at first because of how fast the combat is, but if you hear or see blood squirting from an enemy that wasn’t done by your attacks, it is a spot you can exploit. If you focus your attack on these points, your opponent will generally fall down leaving you room to do a combo or two. It’s a subtle piece of design so you must look carefully an analyze some of the bigger enemies in the game, but doing so will reward you with a much easier victory. As much as you’d like to think you are, you aren’t. You can only take a few hits from a few enemies before you die, and when 6 surround you swinging their various instruments of pain, suffering and torture, it all becomes clear… You must back off. No, really. Use luring tactics to your advantage. The game practically beats you over the head with this idea, yet I still see people swinging their axes thinking they can attack a horde of enemies head-on. While it’s entirely possible, it’s generally going to be quite a challenge. Use those pebbles and bring one enemy away from the pack so you can reign sweet destruction upon his grotesque figure. One of the bold moves Fromsoft made with Bloodborne was that they drastically reduced the magic and item usage in the game. No longer can you spam spells whenever you please, and no longer can you find fifty different consumable items that can buff or be thrown as a weapon. There is one saving grace however, in the form of a Cocktail. While it definitely isn’t the only item you can throw, it is the first one you will have access to. It’s as mean as it is inexpensive, so you would be well off to invest souls in buying some Cocktails. Bloodborne designed the encounters with enemies to be much more dynamic and visceral. This means that you are hardly going to be facing off against only one or two enemies unless they’re particularly tough. 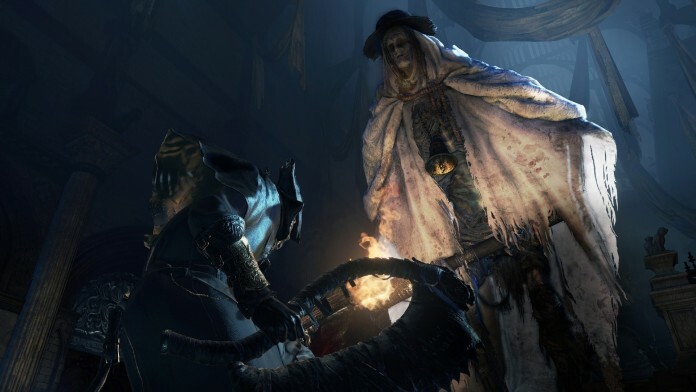 Many times you will walk into an area to see six or seven creatures all perusing the twisted corridors of Yharnam. This opens up a great opportunity for some nice fire damage in the form of a Cocktail. The Souls games have always had wonky camera angles. Sometimes it is a saving grace, and other times it puts your view in the side of a building, blocking you any sort of proper vision for an intense fight. Beyond this, the camera sometimes gets stuck on larger enemies when you lock on, so it’d be in your best interest to practice when and when not to use the lock-on feature, especially considering that when you’ve locked on to an enemy, you roll around them rather than rolling freely. Using this to your advantage may change your scenario from death to victory. Stay behind big enemies, and try not to always lock on. XI – Insight? I Choose Ignorance! Insight is Bloodborne‘s form of humanity. It functions differently than other Souls games however, and it has some adverse effects that many won’t learn until reading some sort of guide or tutorial. If you have a high number of insight (the little eye in the top right corner of the screen), it can actually make the game more challenging. Some enemies might swap out their guns for flamethrowers, as an example. Either burn that insight via co-op, or save up 10 to unlock the Merchant in Hunter’s Dream that allows you to spend insight to purchase rare items. It’s your choice how you use it, but I’d highly recommend keeping it below 15. A major change in Bloodborne is the addition of being able to recover HP by attacking enemies. This only happens when you’ve been hit though, as you’re granted a little bit of time to react and smack the enemy back to regain a piece of your health. What you might not have known, is that even as the enemy dies, you can continuously swing your weapon at his falling corpse to keep regenerating health. It only lasts as long as the enemy is falling to the ground, but you can sometimes get two or three strikes in before it cancels out. This is extremely beneficial if you want to be careful with your Blood Vials. With the advice of going berserk on an enemy for the sake of regenerating HP out of the way, I must also suggest the opposite. It is very important to learn when enough is enough. Sure, victory is granted to those willing to take a risk, but some risks aren’t worth it, so keep an eye on your stamina and HP bars at all times. It might seem smart to just jump at a boss that hit you so you can regain HP, but he might have three more swings left, meaning that you will certainly die. Knowing when to strike and when to retreat for healing purposes is a game of life and death, so I go back to an earlier tip when I say study telegraphy. XIV – No Cheatin’, Ya Hear?! While everyone likes some tips and tricks to ease their pain and anguish, one must reflect on the game they have purchased and what the point of it is. Bloodborne is a game about overcoming your fears and challenges for the ultimate feeling of satisfaction. If you look up walkthroughs and boss strategies, you numb the best feeling this game can give you because you take yourself out of the experience for the sake of having a less frustrating time. Bloodborne isn’t hard, and none of the other Souls games are. Rather, they’re games that don’t hold your hand, don’t tell you what to do, and don’t stop you from playing the way you want to play. You’re thrown into a world of madness and mystery and you must discover what lies at the end of the tunnel on your own. Do yourself a favour and don’t cheat. With that said, good hunting!